Everyone does not need to workout! The biggest workout myth I have ever come across is when people tell me that I don’t need to workout, mainly because I am slim, and not overweight and so on.. Frankly, I really get annoyed with such people, who themselves (almost) never workout and have no interest in living a healthy life, however they are ready to make judgments on other people’s life who are actually making a generous effort! Anyways, my answer to all such people is – My dear friends, please get your facts right! 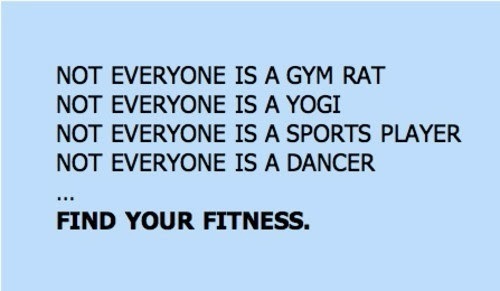 Each and every one of us need to workout. It does not matter whether you are slim, or overweight. Both ways, you must adopt a healthy lifestyle which includes eating fresh, home cooked food and exercising regularly. After all nothing matters without good health. Am I right or am I right? I have had my share of ‘overweight’ days (you know it..!! ), however, I managed to get out of that phase, but trust me it was not easy. It required a lot of dedication and commitment. You have to be committed to your body for your whole life. It does not matter if you have too many problems in your life (we all do! ), or you suffer from mood swings or you crave comfort food – to me, all these are mere excuses! Your body deserves more than that! If you treat it with love and care, your body rewards you with good health and a toned figure. And who does not want that? So the big question is why do slim (or not overweight) people need to exercise? It’s because exercising reduces your chances of falling ill, boosts your metabolism rate, enhances your stamina, makes you feel light, look good and feel confident about yourself. Do you seriously need more reasons? (cause trust me, I have more than you can count)! Hope now you get it.. everyone should (read ‘must’) workout. Factors like gender and age do not matter. Depending on your interest, your likes and dislikes you may choose your favorite sport (like boxing, aerobics, yoga, tennis, football, cycling, running etc. ), but it’s really important to stay active. Specially in winters when people tend to become lazy about everything, you must not neglect your body and it’s needs. And this applies to everyone reading this (even to those who are not reading this article..)! I have said this before and I am saying it again – Our health always seems much more valuable after we lose it. So do yourselves a favor – Get-up and Go. Workout. Leave your lazy self behind and do something for your body. Your body will find a hundred ways to thank you. love this post, I actually come across these ppl in India a lot ! The biggest drain on ur motivation !! shoo shoo!! Godo to hear that your a sports-girl too! Hopefully you're interested in my fitness/health-related posts that start from tomorrow morning, in addition to my fashion-related posts. 🙂 I look forward to hearing your opinion! Keep doing the good work with your blog btw. It's amazing what you've got here! Thank you Surbhi! Agree with you.. Thank you for dropping by and sure I would check your latest posts!